Icing Smiles makes its 10,000th special cake delivery. A beautiful young girl named Everliegh was the recipient of this gift of kindness on her 2nd birthday. This is about much more than cake. After the cake is gone, the memories last forever. We invite you to celebrate a milestone. Icing Smiles makes its 10,000th special cake delivery. A beautiful young girl named Everliegh was the recipient of this gift of kindness on her 2nd birthday. Everleigh didn't get to eat solid foods for many months because she was going through chemotherapy. So she didn't get to enjoy a smash cake on her first birthday the way most children might. But on her 2nd birthday she got a cake that came complete with her favorite character Olaf from the movie, "Frozen." The mission of Icing Smiles is to present kids who've undergone difficult treatments and critical illness with moments (and specialty cakes!) that are all about celebrating their life. On this day, Everleigh was able to put the cancer behind her and be a kid! Her parents Zhade and Jim Ed were so grateful to see Everleigh full of smiles. The sweet young girl has battled Undifferentiated Embryonal Sarcoma, one of the rarest forms of childhood cancer, since October 2014. After surgeries and 6 months of chemo, Everleigh was able to enjoy her 2nd birthday CANCER FREE! 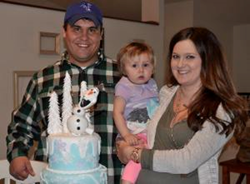 Everleigh's Olaf cake was made by Satin Ice Artist of Excellence, Mercedes Strachwsky of Bake Me a Cake in Florida. Mercedes jumped at the chance to volunteer her skills and she was able to deliver the most amazing work of art. A very special Snow Princess made Everleigh's day even more magical by presenting her with a princess crown, a gift made for royalty. This is about much more than cake. After the cake is gone, the memories last forever. These memories are made of a unique recipe: the kindness of strangers, the art of design, smells of sweet treats, smiles and laughter.